I was recently traveling to visit family for a few days. I was fortunate to receive an advanced First Class upgrade, and I selected Seat 2B. When possible, I like to sit on the side with two seats if traveling on a regional jet. This side of the aircraft usually has more room to store carry-on baggage underneath the seat. In addition, I can put any extra luggage in the overhead compartment directly above me. With today’s highly-functional airline websites, you can select seats quickly and without the assistance of an airline agent. When taking the early flight, I make it a habit to prepare my luggage the night before. In fact, I even have them waiting right by the back door. The routine is to awaken at 3:45 a.m., take a quick shower, dress in short order, and get on the road by 4:30 a.m. Given I’ve checked in online, I can arrive at the airport around 5 a.m., and clearing TSA security takes about 10 minutes this time of the morning. Given I have a little time before the flight begins to board, I visit the United Club where I grab today’s paper and a bowl of cereal. That’s it! I’m ready to fly. On this particular flight, I went to the boarding gate at 5:40 a.m. and was the second to board the small jet. I like to be early because my bags usually travel with me. By avoid checking bags, I can step off the airplane and be on my way immediately, usually saving about 30 minutes. Perhaps more important, there is little chance that my bags will be lost. PASSENGER: Sir, before you sit down … do you mind taking Seat 2A so that I can sit with me wife (see actual pic of man and his wife). It’s also a First Class seat. ME: Sir, I guess I can do that. I like Seat 2B because of the extra storage space. PASSENGER: I really appreciate you making the change. ME: Sure … no problem. The fact is that I didn’t want to give up my seat. I like Seat 2B. I picked it. I had already stowed one bag underneath my seat, and the other right above me. This was my place! 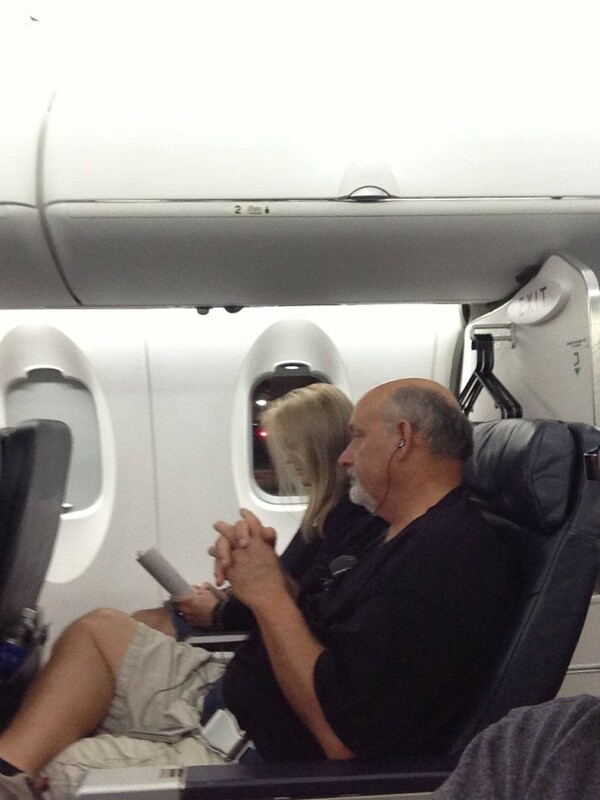 As the flight was preparing to speed down the runway, I looked over to the couple, and noticed they were holding hands. I don’t think they were scared. It was more a feeling of love and affection for each other. After seeing the hands joined and their eyes closed, I realized I did the right thing.